PULLMAN, Wash. – Despite recent rains, the drought settling over Washington state that spurred the governor to declare an emergency last week is likely to grow worse – driven by a strengthening El Nino weather pattern from the Pacific Ocean. El Nino may be renewing hope for relief in drought-stricken California, but it’s more likely to bring more heat and dryness to the Northwest, said a Washington State University climate scientist who’s monitoring the state’s dry-off conditions. El Nino is produced by an ocean-warming phenomenon that can drench some parts of the world while parching others. 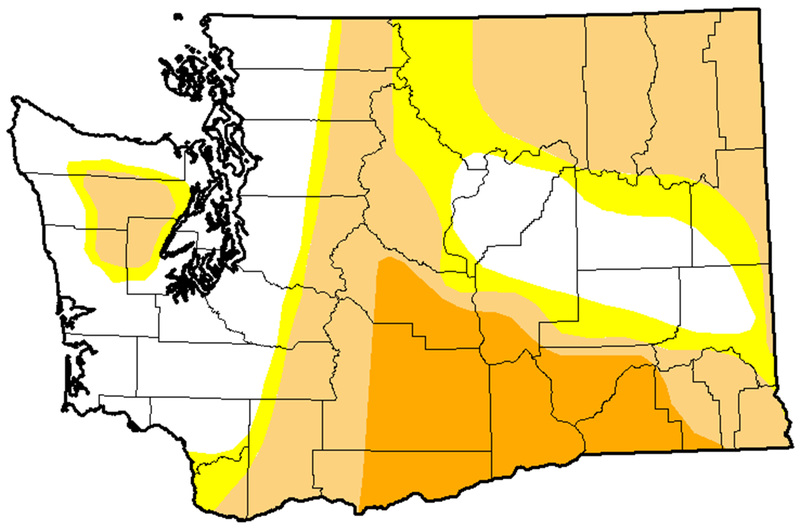 Washington drought: Severe=orange. Moderate=beige. Abnormally dry=yellow. Hoogenboom’s comments come on the heels of an announcement by the National Oceanic and Atmospheric Administration that this potentially powerful weather-maker has been building strength since March. There is a greater than 80 percent chance its climatic conditions will persist through 2015, NOAA officials said. Which isn’t good news for a state facing an already historically low mountain snowpack and depleted water levels in rivers and reservoirs, mainly east of the Cascade Range. So much so that Gov. Jay Inslee has declared a drought emergency in an attempt to avert crop and salmon losses and a perilous fire season. 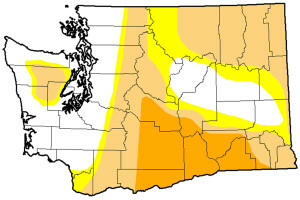 For updates, maps and tips on Washington’s drought conditions, go to the WSU Extension Drought website at http://drought.wsu.edu/. Short but intense rainfall this month, including more than an inch that fell in the Yakima Valley, is a mere drop in the bucket compared to what’s been lost in snowmelt, said Hoogenboom. “In California, the issue is lack of rain. In Washington, it’s a lack of snow,” he explained, adding that rain produces rapid runoff, whereas melting snow gradually melts into rivers, canals and reservoirs over an extended period. Of most concern is a weather pattern called El Nino Southern Oscillation, or ENSO, when warm ocean water in the equatorial Pacific moves like a bathtub full of water being tilted back and forth; this in turn interacts with the atmosphere. “Different factors influence Washington’s climate, but ENSO is one of the most significant,” said Hoogenboom. And there’s no sign of it waning soon, according to Mike Halpert, deputy director of NOAA’s Climate Prediction Center in College Park, Md.